Today's growth and borrowing forecasts are likely to be grim - they are just as likely to be over optimistic. As part of chancellor Osborne’s Autumn Statement today, new growth predictions from the Office of Budget Responsibility (OBR) will be revealed. All economic roads lead back to growth – less growth means fewer jobs, stagnating or falling living standards and further pressures on public spending. 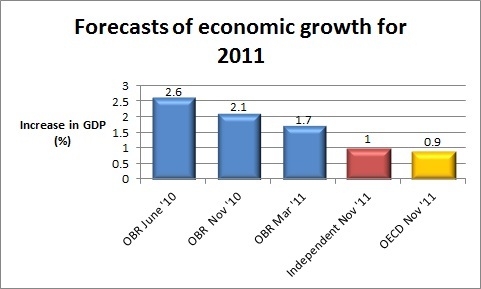 Disappointing growth has also led to the coalition expecting to borrow more than Labour was projected to if it had won the 2010 election. So analysts will be hanging on the chancellor’s words on how much he expects the economy to grow by, and how much he expects the government will have to borrow during this parliament. But it is worth remember that, going on the track record, whatever Osborne announces as the OBR’s projections for growth are, the reality will almost certainly be worse. These have come down drastically – from 2.6% on the snap budget following the election, to 2.1% in November 2010 and then 1.7% last March. However the independent forecasters collated by the Treasury and OECD reckon that growth this year will be as low as 1% and 0.9% respectively. 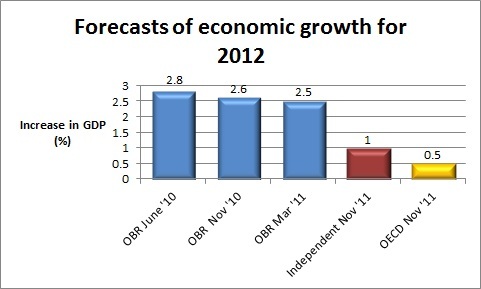 Similarly OBR predictions for 2012 have been similarly downgraded if not to the same extent. While these projections have only been reduced from 2.8% to 2.5%, the independent forecasters and the OECD say they expect UK growth of 1% and 0.5% next year. However bad it sounds today, the reality will probably be worse. And since you said they were cutting too fast, it would be worse under Labour. The problem is that even you wouldn’t take the medicine. That medicine is 30% cuts in public spending. That gets the deficit to zero. Then on top the issue of the vast off the book debts need to be addressed. Both you and the Tories have been running a set of accounts that would make Robert Maxwell blush. No admission in the books to owing anyone any pensions, and yet you take the cash for those pensions. No wonder even you were drastically cutting back on state pensions, but preserving those for people who fund you. And it gets us 25% unemployment and a B credit rating. Great, where do we go from there? No it doesn’t. There are many ways of creating jobs in the private sector. 2. Remove all illegal migrants. Note, 2 and 3 are completely non-racist. It’s a simple test, and nothing to do with ethnicity, etc. That frees up lots of low skilled jobs, lots of properties. Hence you don’t need to build so many houses. Instead, the money can be invested in producing things. Services, widgets, …. 4. Reduce regulations. Makes it more cost effective to employ people – reduces unemployment. 6. Stop rent seeking. Getting government to do the dirty work. Corporatism. 7. Stop all state pensions. Civil service and state pension. However, you have to save. Then, only if the money runs out do the rest of us help. Generates lots of investment money, and that creates jobs. So its depends on how you do it. However, 7,000 bn in debts on an income of 550 bn. How do you solve that without making the debt problem worse? You can’t. Hit the rich and carry on saying they are scum at the same time, and they will move their assets. They don’t need to move personally.